Frequently, when I am ‘up north’ and discussing my research on northeastern Aboriginal peoples during the seventeenth and eighteenth centuries, I am asked one of two questions: Why were there no Aboriginal people living here? Or, what happened to the Aboriginal people who were here? The questions are good ones, and reflect the absence of Aboriginal people from general discussion of Muskoka’s (and much of cottage country’s) past. Though it is changing, many of cottage country’s local museums, community websites and history books focus on the arrival of Europeans and creation of the towns with which we are familiar today, leaving the discussion of Native people to a short handful of sentences to mark what took place before Europeans arrived. Aside from Bruce Hodgins and Jamie Benidickson’s The Temagami Experience, which doesn’t exactly focus on the heart of cottage country, and Patricia Blair’s Lament for a First Nation, there are few scholarly monographs or articles that address Aboriginal people in central Ontario. Like in many places across Canada, history in this part of Ontario is told as a veritable clear-cutting of the past where Aboriginal people were replaced by the lumber industry and subsequent European settlement of the region. It was with this context in mind that, a week and a half ago, I was pleased to see that Peter Kent, the cabinet minister overseeing Parks Canada, designated the displacement of the Anishinaabeg of Southern Georgian Bay a National Historic Event as one of 13 new National Historic Sites, Persons and Events related to Aboriginal people. Of particular focus in this designation is the failed Anishinaabeg settlement at Coldwater, over which, after a series of negotiations, with the Chippewas of Rama, the Chippewas of Georgina Island, the Beausoleil First Nation and the Chippewas of Nawash, the Canadian government tabled a land claims settlement last year . The Coldwater community was an attempt to settle 500 Chippewa, Potawatomi and Odawa near Orillia in the late-1820s and early-1830s. There was meagre government support for the village and few people lived there year-round, choosing instead to maintain their customary economic practices in the Muskoka Lakes and Haliburton Highlands. By 1837, the village had failed, though later reserves were established nearby on Lakes Couchiching and Simcoe (as well as on Lake Huron). This story has great relevance for the history of cottage country. Muskoka, after all, is named after Musquakie (William Yellowhead), one of the men who played an important role in both the settlement at Coldwater and in broader Anishinaabeg/British negotiations during the mid-nineteenth century. Rather than this moniker serving as an epitaph for Anishinaabeg removal from the region, implied by the creation of these southern reserves, the name marked a place that these people continued to use as their hunting territory (Lake Muskoka) into the twentieth century. In addition to the Wahta Mohawk Nation, who moved to Gibson Township from Quebec in 1880, the Anishinaabeg have a long and continued history in Muskoka and along the Georgian Bay shore. Contrary to popular belief, the history of these people in the region is not undocumented. Take, for example, Doe Lake, near Burks Falls, where my family has a cottage. According to Joan Lovisek’s 1991 dissertation on the Anishinaabeg, only Europeans exclusively used the well-known French River route from the Ottawa River to Lake Huron. 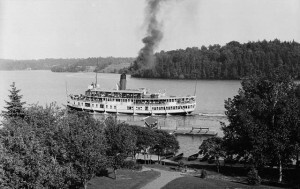 The Anishinaabeg had other routes, some of which passed through Doe Lake (and Lake Vernon near Huntsville) and connected to the Muskoka River. After 1800, Lovisek suggests that Doe Lake periodically served as a trading station in the fur trade. By the 1870s, the European population had exploded and was quickly beginning to impede on Anishinaabeg land use. Between 1871 and 1881, the railway reached Muskoka and the population grew by over five times. As these pressures increased, complaints arose from the Anishinaabeg, who had not participated in the Robinson-Huron Treaty (1850), over Euro-Canadian use of their hunting and fishing lands. In 1911, over fifty years after their complaints had first been lodged, the Indian Department received testimony from the Anishinaabeg regarding the extent of their unsurrendered and unceded hunting territory. Their testimony can be found in Library and Archives Canada’s Indian Department records: RG10 vol. 2328, file 67071-1 and RG10, vol. 2329, file 67071-2. These claims help us to better understand how the Anishinaabeg use Doe Lake. Henry Simon, a Chippewa from Christian Island, testified that for as long as he could remember (at least as early as 1867), he and his family had passed through Doe Lake on their way to their hunting grounds on Sand Lake near the town of Kearney (RG10 vol. 2328, file 67071-1, p. 78, 166-167/ LAC RG10, vol. 2329, file 67071-2, p. 60-61). Similarly, Michael St. Germain claimed from as early as 1829, his family hunting ground was between Doe Lake north (Katrine, Ont) and Pickerel Lake, just north of Burks Falls (RG10 vol. 2328, file 67071-1, p. 20-22, 178-179/ LAC RG10, vol. 2329, file 67071-2, p. 72-73). James Ashquabe may have also travelled through Doe Lake on his way to his family hunting ground between Sand Lake and Lake O-je-che-ka-se-kak. He describes a route similar to Simon and St. Germain but where those men mention Doe Lake, Ashquabe has a list of Anishinaabeg names (RG10 vol. 2328, file 67071-1, p. 48-50). 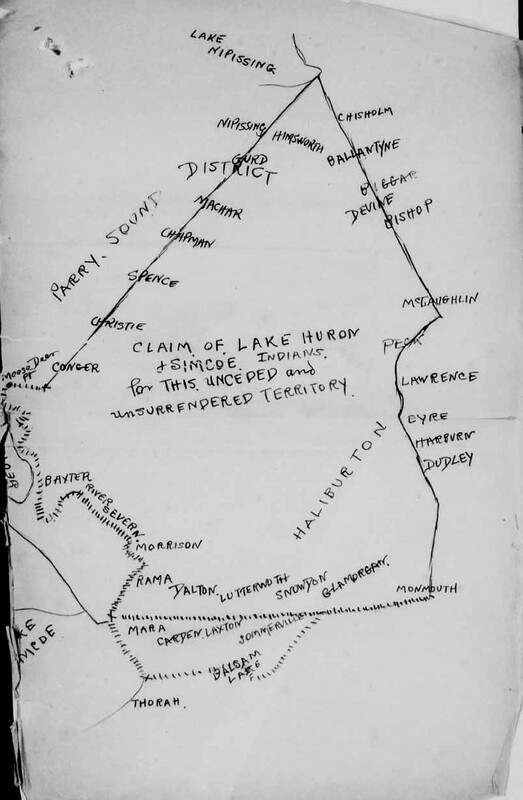 Going through these documents systematically reveals a complex Aboriginal geography that includes many places that will be familiar to cottagers around Bracebridge, Huntsville, the Haliburton Highlands and Algonquin Park. 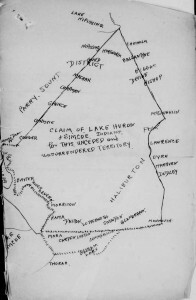 John Bigwind from the Rama Reserve, for example, claimed that his family’s hunting camp was at Cedar Narrows on Lake of Bays (Trading Lake), not too far from where Robinson’s General Store in Dorset sits today. There, in addition to drying furs, Bigwind’s family grew corn, potatoes and pumpkin; they buried their dead on Bigwin Island (LAC RG10, vol. 2329, file 67071-2, p. 70). In addition to these more customary practices, the Anishinaabeg also responded to the arrival of a tourist economy by guiding and craft work. Cottage country was not just a place where Anishinaabeg hunted and passed through, it was a place where they lived. Growing up, my experience of Aboriginal people around Doe Lake amounted to shopping at the ‘blanket shop,’ a trading-post-like store run with the typical array of Aboriginal handicrafts and tourist trinkets, and visiting faux-Aboriginal places like So-Ho-Mish road or summer camps that appropriated Aboriginal terms that may-or-may-not relate to Anishinaabeg culture. The designation of the displacement of the Anishinaabeg of Southern Georgian Bay as a National Historic Event provides a useful starting point on which to more deeply consider the Anishinaabeg presence in Ontario’s cottage country. What is the history of this recreational space? How, over the twentieth century, did it transform from Anishinaabeg hunting camps into a vacation destination? And what role do First Nations have in this territory today? Much thanks to Andrew Watson for his help in writing this post. First, Neil Forkey’s Shaping the Upper Canadian Frontier: Environment, Society, and Culture in the Trent Valley (Calgary: University of Calgary Press, 2003) explores the Aboriginal history of the Kawartha Lakes region of the Trent Valley and the ecological effects of European resettlement. He details the consequences of such changes for the Mississauga. Claire Campbell’s Shaped by the West Wind: Nature and History in Georgian Bay (Vancouver: UBC Press, 2005) tackles the exact problem you outline in this post about the erasure of Aboriginal history from this part of Ontario. In the third chapter of this book, Campbell examines the re-imagining of the Georgian Bay region as a wilderness and the effects this had on local First Nations as the “identification between an intractable wilderness and an uncivilized people became even more entrenched over the course of the nineteenth century” (98). More recently, David McNab has written about First Nations land claims in this region of Ontario through the Bear Island case in No Place for Fairness: Indigenous Land Rights and Policy in the Bear Island Case and Beyond (Montreal: McGill-Queen’s University Press, 2009). Finally, Jocelyn Thorpe’s very recently published monograph Temagami’s Tangled Wild: Race, Gender, and the Making of Canadian Nature (Vancouver: UBC Press, 2012) most directly addresses the history of land use conflict and tensions between First Nations peoples of the Temagami region, industrial logging, and recreational tourism in the nineteenth and twentieth centuries. For those interested in learning more about this research, I interviewed Jocelyn on Nature’s Past back in 2009 (http://niche-canada.org/node/9262). Glad to find your article. I am curious to learn more about burial grounds on Bigwin Island, having spent many years on Lake of Bays. One of my English forebears came to Lake Muskoka because of advertisements of Canada’s Free Land Grants. That’s part of the story of development in the region. Also the logging to build Toronto. Barbara have you read Reluctant Pioneer? You should! There is a Snohomish in Washington State.